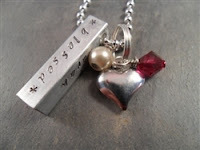 $12.95 for a Beautiful Handstamped Necklace of Your Choice! Today at DailyMomDeal, you can get a handstamped necklace for only $12.95! These regularly cost $26. I have a few handstamped necklaces and they are so beautiful and unique; I get compliments whenever I wear one out! Click here for more info! Shipping is $3.99 to US or $2.99 to Canada.